This has got to be one of my favourite salads. The honey-lime dressing is light and refreshing. The salad ingredients provide a mixture of textures. It feels like it should be naughty and yet, it also feels very healthy. I could easily eat this most days. I have been using turkey mince in lieu of beef, partly because it is leaner and happens to be a little less expensive. However, once you add the seasoning to the meat you really don’t notice if it is beef or turkey. You could also just replace this with re-fried beans if you wanted to avoid meat altogether. Serves 4. I would serve it on its own as a meal on a warm summer evening. Start by preparing the mince. Heat a little oil in a frying pan and sauté the mince until it is cooked through and browned. I find it easier to do this in two batches, preventing the meat from overcrowding and boiling away in its own juice. Once the meat is browned, add the taco seasoning blend and 200ml of water and stir well. Cover the pan and simmer on low heat for 20mins. 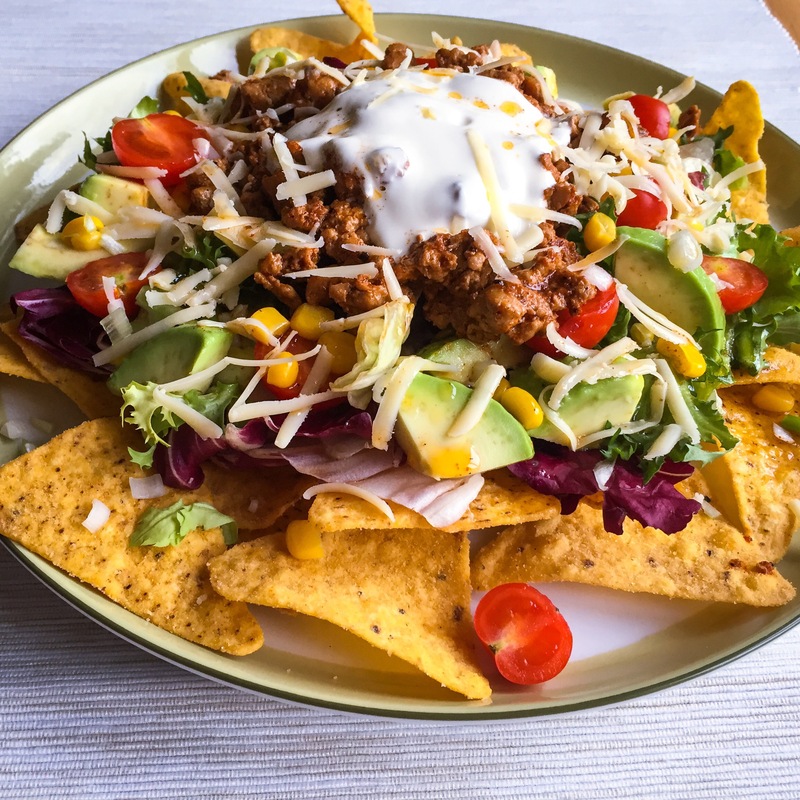 Arrange a large handful of tortilla chips on each plate, providing a single layer for the bottom of the salad. Top this with two handfuls of your mixed lettuce leaves. Peel and slice the avocado, arranging this over the lettuce. Allowing for half an avocado per person. Thinly slice the spring onion and halve the tomatoes, adding these also to the salad. Then sprinkle the sweetcorn over before spooning the prepared mince on top of the salad. Top this with a dollop of soured cream and a light grating of cheddar cheese. Drizzle the dressing over top and serve!